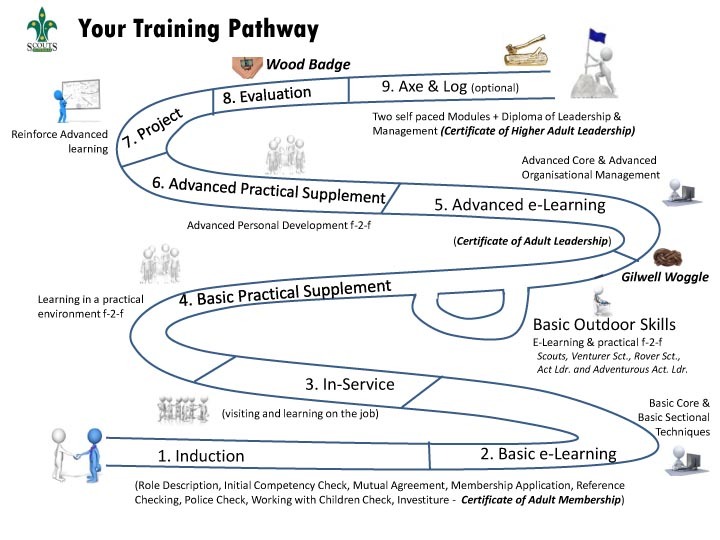 Supporting our exciting youth development programs is an adult training and development program known internationally as the Wood Badge Training Scheme. Training and development of adult volunteers is compulsory to ensure that our Leaders have the necessary skills and knowledge to lead young people and other adults. Also, keeping training current is important and it is expected that a Leader will complete an elective at least once a year. Leadership and personal development training is provided through the Scouts Australia Institute of Training – NSW Campus, a registered training organisation that is accredited to run qualifications that are recognised outside of Scouts Australia. The majority of Adult Appointments can be held on completion of Basic Leader Training. On completion of basic training, Leaders are eligible for the award of the Certificate of Adult Leadership and may choose to obtain the Certificate III in Business.